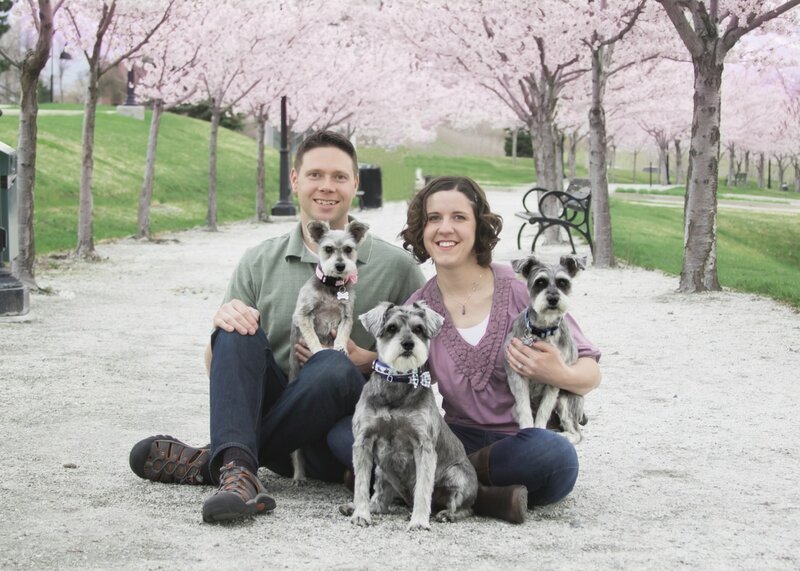 Dr. Ali with her husband Clint and their schnauzers Maycee, Wiley, and Lily. Dr. Alissa Grover ("Dr. Ali") graduated Valedictorian of her class from Palmer College of Chiropractic in Davenport, Iowa, where the chiropractic profession was founded. She completed an additional 220-hours of continuing education on animal chiropractic from Parker College of Chiropractic in Dallas, Texas. She is a certified animal chiropractor by the American Veterinary Chiropractic Association (AVCA). Currently, Dr. Ali is one of only a handful of AVCA-certified doctors in the entire state of Utah. Also a certified Reiki master, Dr. Ali enjoys using energy work and kinesiology testing in addition to chiropractic. Dr. Ali did her internship at Noah’s Ark Chiropractic in Geneseo, Illinois, a unique human-and-animal chiropractic practice. There she trained with Dr. Shanie Cahill, one of the leading animal chiropractors in the field. Dr. Ali and her husband moved to Utah in the spring of 2013 and she has worked at the Animal Care Center ever since. Dr. Ali loves working with animals and being able to offer a holistic approach to healing. She feels right at home at the Animal Care Center, where traditional veterinary medicine and alternative therapies are used cooperatively based on the best needs of the patient. Dr. Ali has an alter ego as a musician, and she has a Bachelor of Music from the University of Iowa in music performance and education. She taught public school band for one year before deciding to become an animal chiropractor. Highlights of her musical career include winning the Drum Corps International Championship with the Blue Devils Drum and Bugle Corps in 2007 as a mellophone player, and playing her French horn with the Mannheim Steamroller Orchestra in 2011. Dr. Ali met her husband, Dr. Clint Grover (also a chiropractor and musician) while playing in the Quad City Community Symphony Orchestra together. They enjoy playing in a Flat Canyon Band, a rock group with several of the other Animal Care Center employees, and can be heard at social events throughout the community. Dr. Ali and Dr. Clint also play with the Salt Lake Symphony on a regular basis. Dr. Ali and Dr. Clint welcomed a baby boy, Gabriel Jaren, into their family on December 29, 2017. Although she misses her hometown of Davenport, Iowa, Dr. Ali loves the Mountain West and all of the outdoor activities that go along with it. Her and her husband enjoy going on hikes with Gabriel and their miniature schnauzers, Wiley, Lily & Maycee. Dr. Ali is living her dream by working with the wonderful veterinarians, staff, and patients at the Animal Care Center, South Valley Large Animal Clinic, Powder Paws, Alta Dog Rehab, and Utah Pet Rehab. She also enjoys traveling throughout Utah to adjust horses, dogs, cats, and other animals.